This is the year of saying “Yes!” . I am not sure why i have a tendency to hesitate or say no to life’s many offerings. 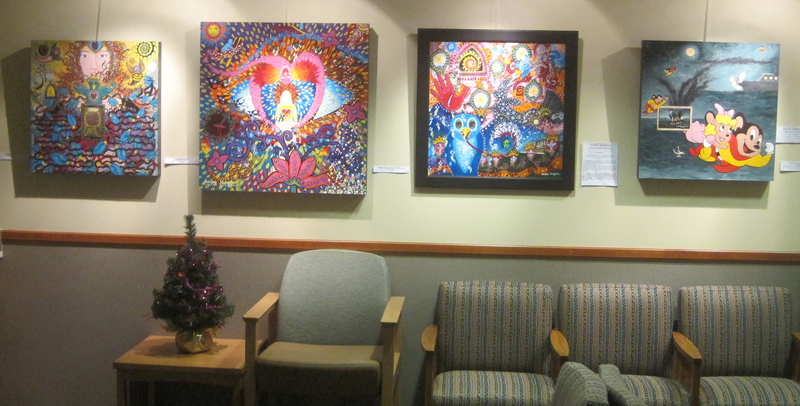 For example, a friend of mine asked me if i wanted to hang my paintings in the gallery at our local hospital. My first reaction was no- a thought kept running through my head that the people who came into the hospital wouldn’t like my work because it is not realistic nature scenes and the other thought was that it would probably take me a day to dust off the frames, type up the titles, descriptions,update my bio, artist statement etc. Then i remembered: this is the year of saying yes! I mean really- what do i have to lose?- my paintings are being stored in the closet of my guest room. Yes, it did take pretty much all day to do the paper work part but it made me really think about how to describe the change in style that my paintings have under gone over the last few years. I realized that a more apt description for them was “Intuitive Visionary Paintings” instead of “Process Paintings”. (my new artist statement for them is below) I also realized that i really needed to get those paintings out of the closet & in an environment where the frames were less likely to get damaged- my house is running out of wall space so i hung everything that i didn’t take to the hospital on the walls of my garage. They look great & it is fun to turn my garage into an art gallery of sorts! And today in spinning class, a friend who saw my paintings raved about them! YAY! Tip #3 Just say Yes! when life offers you opportunities. The other good thing that happened for me is i got to see some of my older vintage postcard inspired paintings hanging together again- it s so fun to take a trip down memory lane with one’s art work and nice to know that i still love those pieces too!! Well- i am off on a 5 week trip to Myanmar, Cambodia,Laos & Thailand. I said yes! to something there that i am both excited & a little nervous about by setting up a little adventure ahead of time in Myanmar- a hot air balloon ride over the Valley of 1000 Temples!! See you in March! I define intuitive art as a creative process that allows images to appear from the “well” within without editing them. Sometimes I am processing my life through these images and sometimes I am completely surprised by the images that appear. My Art Process: my intuitive, visionary painting process involves allowing images to appear even though my analytical mind screams “This can’t be right!”, synchronicities with the “right” materials appearing and ritual in the studio involving music and meditation. I may work on a painting for several days or several months. I use acrylics, charcoal, pencil, oil pastels, plaster, wax, molding paste, collage items etc. on these paintings. ~ by Deedee Hampton on January 16, 2013.